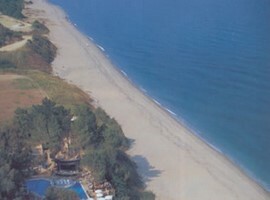 At the south-western side of Epirus at the cape of Preveza lays the Roman city called Nikopolis. In 31 BC, Octavianus Augustus founded the city after the naval battle of Actium. Epictetus (AD 89) and many other intellectuals of the period congregated in Nikopolis. 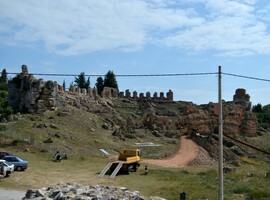 The city got populated gradually in the period of Byzantine. 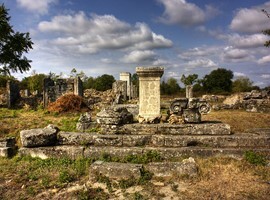 In the Early Byzantine and Roman period, it flourished as the capital of the province of Old Epirus (Epirus Vetus). Nowadays, in the area, the festival of Actium is celebrated in every four years in which many contests are held, such as racing, athletic and musical competitions. 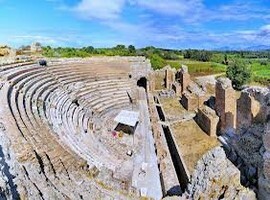 Within the archaeological site lie the Roman fortifications, the Odeon and the Theater (1st c. AD), the Monument of Emperor Octavian, the Nymfaion, the Byzantine walls, basilicas of the early Christian era and the so-called “Vassilospito” (in Greek means the King’s House), a Roman edifice also used during the Christian era. 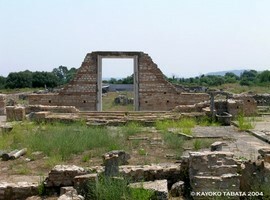 The Archaeological Society conducted the first systematic excavations on the site of Nikopolis in the year 1913-1926, under the support of Al. Philadelpheus. Later on, the professors A. Orlandos and G. Soteriou continued the excavation till the year 1938. 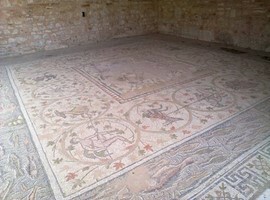 After that, the Ephor of Antiquities, J. Papademetriou, in the Gymnasium area carried out a limited excavation; however his excavation was put on hold due to the World War II. A. Orlandos again started the work in the year 1956 with the support of the Archaeological Society and the work continued till 9 more years. The rescue excavations have been carried out since then by the local Ephorate. The Odeum was built in the first century on the western side of the Early Christian wall. The place consists of the orchestra, the auditorium and the scene. As the ground is plain and does not have any slope, three semi-circular arcades are built for inclination purposes. 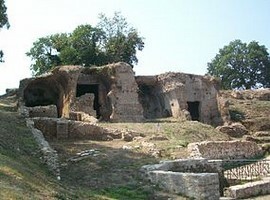 Odeum was in use till the second half of the third century. 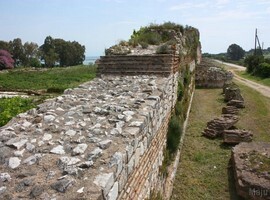 On the west side of the Roman walls lays the Nymphaion. It has two buildings that are rectangular in shape. One of the building was erected in the early third century. There is no clear historical information about the buildings; if they were built at the same time or constructed in different time period. The buildings have an underrated, simple concealment, and position in the interior. There is also an aqueduct that used to carry the potable water to the city of Nikopolis from the springs of the Agios Georgios village (see more information below). In 31 BC after the triumph at the battle of Actium, the Augustus monument was stood up Octavianus Augustus. The monument was devoted to the gods; Actium’s Apollo, Ares (Mars) and Poseidon. Also, there is a large Π-shaped podium, it is basically a stone and it’s embellished with bronze beaks from the ships of Antonius. Finally, in the same place are hosted some trophies from the battle that are placed above the plinth in an arcade. 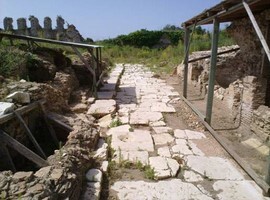 The Romans constructed the aqueduct that used to carry the potable water to the city of Nikopolis from the springs of the Agios Georgios village. When Nikopolis was founded, Augustus constructed the aqueduct to supply the water to the newly born city. The channel was fifty kilometre long and was divided into three parts. Each part was constructed in a different way. One of the parts was a channel with arched and ventilated shafts and further; it was water proof. The other part was a tunnel that was leading out in the valley of Kokkinopelos. The third part consists of arcaded bridges. These bridges were used to carry water across the hills. The ancient theatre lies at the south-eastern side of the Augustus monument. It was built in the first century. It had three arched entrances and to allow the spectators to enter the cavea, three subterranean corridors were built, hold by three semi-circular stoas. The height of the scene could be two-storeyed.